Self-portraits have always reflected self-esteem. It was true in the Renaissance. It was true for Rembrandt, whose late works, which include many self-portraits, go on display in the National Gallery on Thursday. And it is true for us now. The current obsession with selfies – with makeup or without – reflects a surge in self-confidence that is both admirable and dangerous. In the early Renaissance, the social status of the artist underwent a sea change. Artists and scientists – for there was scarcely a distinction, in those days – formed the vanguard of a burgeoning spirit of inquiry, which laid the foundations for the modern age. It is no surprise, then, that from the early Renaissance onward, artists began to make a bid for immortality. The first commissioned biographies of artists started to appear. Artists began to sign their work for the first time. But the most telling sign, by far, of this growing self-possession was the new practice of self-portraiture – and when we think of self-portraiture, we naturally think of Rembrandt. Rembrandt leaves behind 80 renderings of his own image, between paintings, drawings and etchings. His preoccupation with self-portraiture was not a passing fancy of youth, nor was it an old man’s obsession: it spans his entire career. The National Gallery exhibition treats us to some poignant examples from his later years; in the first room, for example, we encounter four self-portraits from the last decade of his life. The sheer number of surviving self-portraits attests to a marked self-confidence on his part, and a desire to be immortalised. Rembrandt wanted us to remember him, because he mattered. And when we take a selfie, we are making the same statement. We are saying: Look at me. I matter. I deserve to be depicted, too. Why, then, does Stephen Fry wish that the iPhone didn’t have a camera – specifically, so that the arrival of the selfie might have been avoided? The master gives us a clue. Rembrandt’s self-portraits change, as he closely monitors the traces of time. The later self-portraits are particularly striking. Facing bankruptcy, having endured the deaths of many of those most dear to him, Rembrandt stood before the mirror and painted himself. His self-portraits show him, not as he wished he might have been, but as he was: ageing, thickening, alone in the gathering gloom. He wanted us to remember him – as an artist, certainly, but also as a man: bereaved, lonely perhaps, but undeniably proud. This is why Simon Schama calls him an “everyman”: in his face, so carefully detailed, we see “countless other personae”. We look at him, as he looks at us, and we feel that we understand him. What about our selfies? Do we, too, want to be seen as we really are? Do we want to meticulously chart the lateral progress of our crow’s feet, the widening of our hips? The sagging of our skin? We are not so clear-eyed. We worry about our “good side”. We fret about looking fat. We rush to de-tag those Facebook photos that have caught our lazy eye, or our crooked tooth; we try to erase our most personal imperfections. Being photogenic is more important than looking like ourselves. Rembrandt got certain aspects of his physiognomy slightly wrong, between self-portraits – his eyes are larger in some depictions than in others, his face longer or shorter – but he always paid close attention to his asymmetric features. In fact, the particular precision with which he renders the furrows on his brow, and the droop of his eyelids, is one of the markers that enable art historians to evaluate the authenticity of a putative Rembrandt. He was meticulous in detailing his own physical flaws. When we hold our iPhone aloft to take a selfie – always from above, never from below – we are not so scrupulous. Rembrandt was painstaking, certainly; but maybe he wasn’t all that honest, after all. Maybe he was sentimentalising the image of himself. Rather than being driven by an internal, proto-Romantic compulsion to explore his own soul via his self-image, maybe he was meeting a demand for “portraits of the artist, by the artist”. Or maybe he was just interested in the careful representation of the human form – for which explorations he was, of course, his own most patient and obliging sitter. We will probably never be sure. One thing is clear, though: his images required care, thought, skill. They took time. They were the product of a long and careful look, and another, and another; they did not issue from one throwaway glance. And that is what we learn from Rembrandt. With Snapchat, the self-portrait becomes disposable. We click, we send, and as the recenthacking scandal reveals, we do not wish to look again. We want to be the centre of attention, that is – but never for too long. 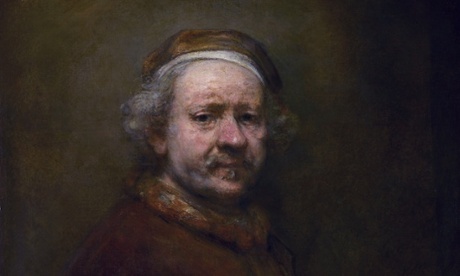 Unlike Rembrandt’s self-portraits, our selfies don’t bear scrutiny. Self-confidence is indispensable. It is the cornerstone of the human rights movement: it is the necessary precursor to that raising of long-silent voices that is the pride of our modern age. It is important to say, in the face of an indifferent society: “We matter”. But the more we gaze at our own faces, or at the screens of our iPhones, the less we see of the world around us. We are tempted to have experiences for the purpose of photographing them, and apply a filter to them, because the last thing we want is for our lives to look ordinary. But when we stand before a Rembrandt self-portrait, we realise that being ordinary – being human – is where the real interest lies. Even in his later years, Rembrandt kept exploring, challenging himself, pushing the boundaries of his skill. When it comes to the composition of figures, or the representation of light, or the explorations of texture, Rembrandt “never resorted to ready-made solutions”, as the art historian Ernst Van de Wetering puts it. 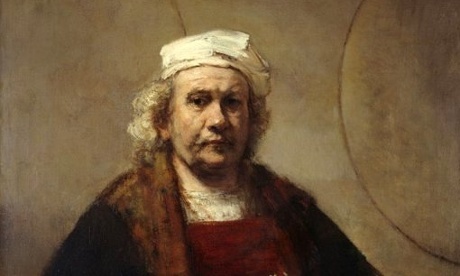 One can only imagine what Rembrandt would have thought of Instagram’s one-size-fits-all filters. Self-confidence is not a problem. And self-portraits aren’t a problem. It’s when the self-portrait becomes a selfie – trivial, banal, and ultimately disposable – that we should tread carefully. The selfie threatens to distract us from what we should be doing, and what Rembrandt did: looking at ourselves closely, honestly, but compassionately. Rembrandt teaches us to take care. He teaches us to create self-portraits, rather than taking selfies. He teaches us to look again.